My girls often travel to and from the art table, play kitchen, playroom sink, and bathroom sink. I can't even tell you how many times they do this throughout the day. They are always carrying pots and pans, tea cups, tea pot, etc. By being present and watching their play it led me to this invitation. On the left hand side I have a big bin with various items: balls, blocks, playmobil people, animals, play food, etc. You can throw whatever you want in there. The middle bin has water beads. The white tray on the right is filled with various gems. Laying across the floor are spoons/ladles of various sizes. On the right side of the blanket I have clear empty containers of various shapes and sizes. Add stepping stones that they have to walk across. Another alternative. This is an agility ladder that they can walk through without stepping on the "cracks". You can also just lay a rope down to act as a balance beam. My 22 Month old was the first up and she went right for the spoons. "Mommy spoon, Daddy spoon, Baby spoon"
After her initial reaction she stopped, looked around, and said "Mommy, you made a mess!" LOL LOL! She then proceeded to put everything away. She literally put 80% of the invitation away. I had to set the invitation back up for my oldest! Carrying water beads to the empty containers. My oldest went straight for the water beads. Always a favorite in our house. This invitation was left out all morning and they visited it as they pleased. My oldest loved giving her playmobil people "rides to the beach." My 2 Month old in the background checking everything out. First, let me tell you my kids pick out their own clothes. My 22 month old decided to go Rico Suave today. My oldest's solution to being able to carry more across?? Put them in her underwear! Now that is some problem solving. I just love watching their brains work. Playmobil people on the "other side" in a plastic egg carton. While the older two were playing I was sitting down next to my 2 month old talking, singing, reading, and quietly observing. Oh my goodness, I am cracking up at your middle daughter putting away your "mess". Great idea! How do you store your water beads? In water? Dried back out? Or do you throw each batch away when finished? Given that limiting her photos would wipe A LOT of them (these kids always seem to be in their undies haha!) I really think we shouldn't let ourselves be scared by disgusting individuals. Yes the thought of photos being used inappropriately gives me the creeps, BUT it is unlikely that any of us will ever find out that it is actually happening to one of our pictures. Ignorance is bliss right? So why should we suffer and sensor ourselves just because sick people exist? Sorry guys, but I thought the same thing as Amanda; I as a mother see NOTHING wrong with the photos, but I don't want other people using my child, period. This is why my daughter usually is ALWAYS in a one piece & I am not like sgt. abt it but my boys usually always wear trunks & a swim shirt. A swim shirt on her is an option too, in my opinion. I just worry that posting a pic that I could otherwise just withhold from the public (yet still have it for myself), I worry that action could provoke another person on the world wide web to potentially harm my child. Do you just not like... require they wear pants? It's not bad that they're in their undies ~ believe me, it happens here, too, quite often!! LOL I just try not to take pics of them unless they are fully clothed or modestly dressed, or try to crop things out, etc... IDK I may be waaay too paranoid, but I felt scared for your kids when I saw those pics. :( I know you guys would never intentionally put them out there to harm your children but I think I am just more keenly aware of how sick some people are, and how completely exposed our blogs are. Sweet and so fun! I love watching my son sort and compartmentalize things. He reminds me of how I used to have many "treasure boxes" and containers full of things. I get a kick out of what does and does not go together. Cracks me up when the use their underwear as a pocket! Many a day I've walked into the room and they are stuffed with an assortment of objects "to carry". The very first lesson I learned in my Montessori training was "how to carry a tray with a glass of water on it" How kids love to concentrate! What a lovely activity and invitation!! It is no wonder that in such a happy and positive environment, your girls want to play all day!! I love how you do the invitation. I have yet to try it. I think I'll give it a try this week after my girls get up from nap. Looks like fun. I'm glad my son isn't the only one who stores things in his underpants. When he first started wearing big boy pants he said, "Wow, mom, look. There's a pee pee pocket." I love the pic with the 2 month old just checking everything out. Looks like such a great time! I hope I have the sense to show some restraint when my daughter is playing and let her guide her play time too. Hi! Love the great ideas on this site! I am a homeschooling mom and am always looking for fun ideas for my 2 boys. 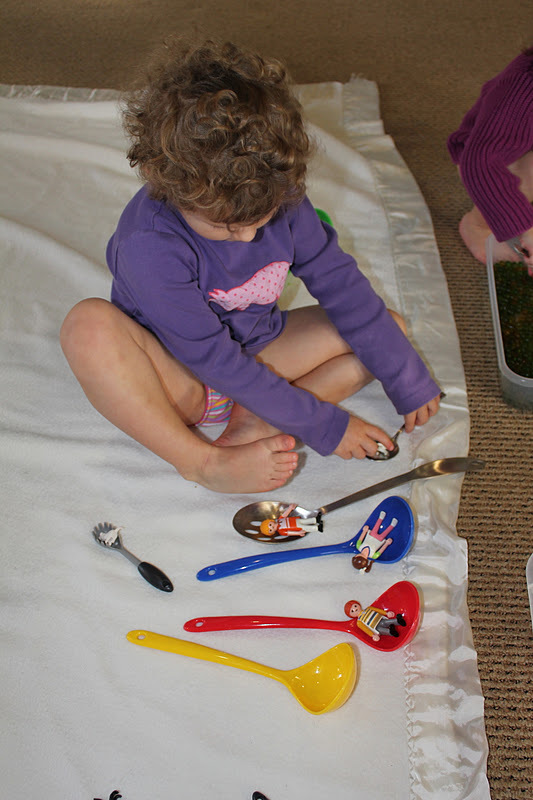 I was wondering...in the picture of the little girl putting up the spoons, there is a board with clear bins hanging on it and also the hook for spoons. Does anyone know where I might find and board and bins like this? it would be great for our "school room" . It looks like RL has a really cool room set up! From where u get this white sheet or you made this? Fabulous but with carpet? My waterbeads in Australia stain. so simple and yet so fun. thank you so musc for your wonderful blog and sharing your days with us. So inspiring.